Dona nobis pacem became a somewhat unexpected hit for Vaughan Williams. A fervently antiwar plea, the work remains to this day one of the composer's most widely performed works. 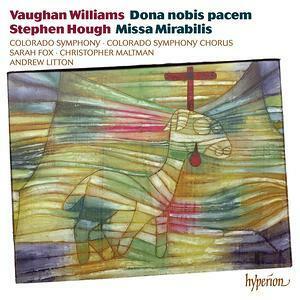 Coupled with it here is the first recording of Stephen Hough's Missa Mirabilis (the title derives from an unfortunate motorway incident), a work which shares with the Vaughan Williams an ability to seem very much greater than the sum of its parts. Andrew Litton directs the Colorado Symphony and all-star soloists Sarah Fox and Christopher Maltman.